Perhaps one of the only things more painful than enduring a divorce is living through a broken marriage. 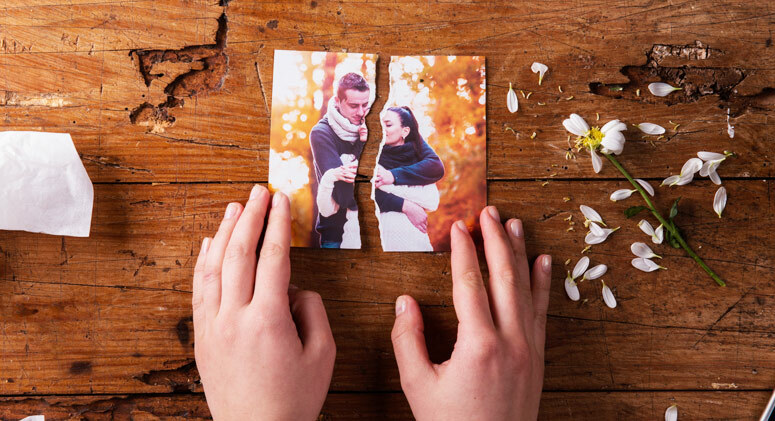 Divorce is a time of transition—an emotionally shattering process that is the only path to a happier, more hopeful future. Can you minimize the psychic wallop you’re feeling? If you understand the source of the hurt, you can make simple changes that can ease the agony. How many of these pain triggers do you have—how many does your spouse have? If you don’t have strong ties to friends or family, you can feel like a divorce will leave you utterly alone in the world. For those of you who have had a hard time forming relationships, divorce will almost certainly feel like being abandoned. The reaction is often overwhelming anger, especially when those fears have been shared with the spouse, but the divorce proceeds anyway. This leads to the classic “ugly” divorce in which the only people to profit are the lawyers. The Fix: Shore up your confidence. You won’t always be alone; there’s someone out there for everyone. If your marriage isn’t working, then this wasn’t the right person for you, and you can’t get to the real winner until you move past this relationship. Remember that trying to keep more of the family assets will do nothing to ease your loneliness. Trying to punish your spouse for wounding your spirit will probably end up being the most expensively unsatisfying experience of your life. If you and your spouse shared life responsibilities, then having to take on 100% of the tasks is frightening. Perplexingly, this is most common among wealthy couples. Fear of poverty seems irrational when there are generous assets to be distributed, but for the spouse who never had to worry about money before the divorce, the required change in mentality is sometimes undigestible. Foot-dragging and stall tactics slow the process of divorce as a result, even when the fearful person was the one who initiated the divorce. The Fix: Financial planning can be easier through divorce mediation (as opposed to using lawyers) because the mediator is committed to a fair distribution of assets and not on just “the win”. Equip yourself with knowledge on income projections, budgeting, comparison to others in your geographic area, life planning, a re-evaluation of how much money you’ll be spending on adult children, stepping up your earning, selling your house, etc. Own the reality: You cannot expect to be in the same financial situation after your divorce as you were in your marriage—even if the divorce was not your idea. Some divorcing parents are afraid they’ll lose touch with their children and will never again feel like part of a family. Even if you won’t admit to this fear, untethering from the family is so painful that you might put up roadblocks to the divorce—like settlement offers, bargaining tactics, punishments disguised as offers, and unending reasons why the case cannot be settled. The fear of untethering is self-inflicted, and generally reflects that parent’s lack of involvement with the family prior to the divorce. The Fix: Get more involved in your children’s lives. Create a new type of family as a single parent. Often, the less involved parent discovers the capacity to be a wonderful father or mother once the other spouse is no longer in the picture. It’s never too late to show your children how much you love and care about them. Go out and have a fun day with them, enjoy a pleasant meal, get to know their friends. Your kids will benefit from some happy, unstructured time with you. When your love and trust is shattered, it’s hard not to want to put the other person through hell, too. That’s just human nature. But you can ease your pain during the divorce by understanding the fears that may be motivating you. It wouldn’t hurt so much if you hadn’t loved so deeply. Your agony is a testament to how strongly you can feel. There will be happiness in your future. Try not to make your present into a battlefield… and be kind to yourself.